MIT's Computer Science and Artificial Intelligence Lab (CSAIL) is developing a robot that sorts for recycling. Fundamentally, the squad's robot arm has soft grippers ad the robot can take objects from a conveyor belt and identify what they are made from— by touch. Tactile sensors on the robot are the main feature. The sensorized gripper is fully electrical driven. It can detect the difference between paper, metal and plastic. Why this matters: "Although environmental and sustainability concerns have made it crucial to scale up recycling operations, object sorting remains a critical bottleneck for recycling scalability," they wrote in their paper that describes their work. Well, one can say that is putting it politely. MIT Technology Review wrote "the way we sort waste needs to get much better." Douglas Heaven said that "Many large recycling centers already use magnets to pull out metals, and air filters to separate paper from heavier plastics. Even so, most sorting is still done by hand. It's dirty and dangerous work." The robot team actually went further with sobering facts in the article, "Soft robotic grippers are a natural solution for automated recycling," by a team of authors with affiliations including MIT CSAIL and Yale University. Not only that but most facilities still employ large amounts of manual labor to grasp and sort objects that escape automation. They said, "This can lead to unsafe working conditions, especially in facilities where normal waste is mixed with recyclables." So, without further ado, meet RoCycle, a recycling robot. Recycling automatically could alleviate such a labor-intensive process; this robot can recycle automatically. "This classifier works over a variety of objects," they wrote, "including those that would fool a purely vision-based system." Embedded tactile sensors help RoCycle determine what material it's dealing with. The gripper components are a pair of cylinders and high deformation capacitive pressure and strain sensors. Earlier this month, a video was posted to show the robot at work grabbing boxes, cups and cans. 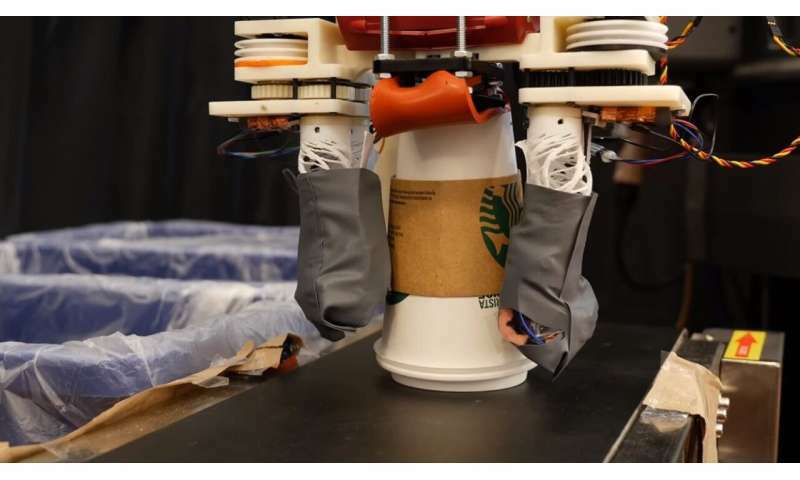 Paper cup, empty box, soda bottle—pressure sensors can tell the material of an object "by how much it squishes," according to the video. Rather than relying on vision, it tells a metal object from one that looks like metal by sensing its conductivity. So, the video shows it can work, but how well can it work over time? The authors said that "Our materials classifier has 85 percent accuracy with a stationary gripper and 63 percent accuracy in a simulated recycling pipeline." What's next? The team is interested in improving the robot's accuracy. "Though RoCycle is already pretty impressive, as the video shows, it could do better. The research team plans to meld RoCycle's sense of touch with video input from cameras to improve sorting accuracy," said Amanda Kooser in CNET. In the real world? "Chin thinks that such robots could be used in places like apartment blocks or on university campuses to carry out first-pass sorting of people's recycling," said Heaven.